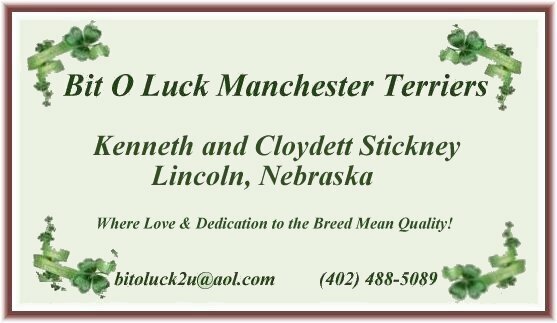 Bit 'O Luck Manchesters, located in Lincoln, Nebraska , has been deeply involved with this wonderful breed for several years exhibiting in Conformation and a bit of Obedience. We've produced many champions over the years and several of our Manchesters have earned their way into the Hall of Fame. We breed for temperament, conformation, type and soundness of the breed, but, our dogs are also 'members' of our family - and loved and "spoiled" as such. We do not breed our dogs irresponsibly just to produce Manchesters. Quality is of utmost importance to us and we only breed to improve upon what is required of the breed according to the AKC Standard of Perfection. We plan each and every litter based upon what is in the best interest of the breed - not just to have puppies for sale. No ethical reputable breeder will have puppies constantly available - most will only have one, perhaps, two litters a year, if that. 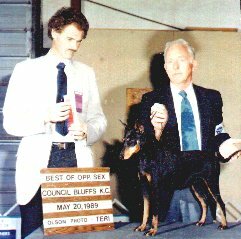 If you contact so called breeders with puppies always available, our advice is to look further until you find a proper breeder of the Manchester Terrier. We will gladly help you locate a puppy through a reputable breeder if we have nothing available. On this, and the following pages, you will learn about how Bit 'O Luck got it's start - finding a cold hungry dog a few feet from our house...who went on to become Brandyman's Mr. Pibbs (with a Group 2 and 3 to his credit) and the foundation of what we've become today - quite a ''Bit 'O Luck" - wouldn't you agree? Above, are the two dogs that gave Bit 'O Luck it's "beginning", so to speak. Ch. Whiteoak Lady Diane C.D. - Breeder Ruth Guthrie - and Brandyman's Mr. Pibbs. Bit 'O Luck Keepin' Quiet a.k.a. "Missy"is in the Hall of Fame. 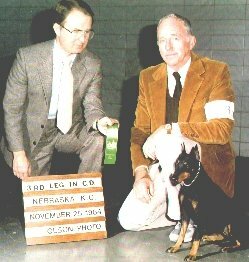 Whiteoak Khamir LeBaron - Breeder Ruth Guthrie - also in the Hall of Fame. Several years ago, a beautiful sweet dog was found outside just a little "bit" from our home. He was shivering and so very hungry so we took him in to our home. We didn't recognize what breed he was way back then but we knew he was a purebred. 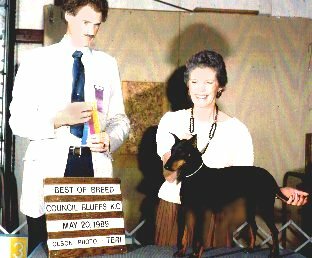 Long time Manchester Terrier breeder, Ruth Guthrie, recognized his ear crop. After tracing him back to his original breeder in Washington, it was found he had been sold to someone who couldn't keep him and he was given to a relative who also placed him...again he was given away to someone who had mistreated him...and he ran away...to us...where he became a part of our family and loved and cherished for the wonderful dog he was. Our hearts fell in love with the Std. Manchester and soon after, Whiteoak Lady Diane - bred by Ruth Guthrie - joined our 'family' - and the rest....is History. 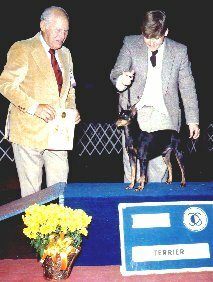 Bit 'O Luck Manchesters can be found in show and pet homes across the U.S. and in past, present and most likely, future pedigrees of this wonderful breed. Until the tragic umtimely death of BIS Can./Am. Ch. Bit O Luck DemonMoon Mystic, our Manchesters were making their presence well known in Canada, as well. "Misty" won a Canadian Best in Show of which we are extremely proud, as well as, many Group Placements. Misty was the "daughter" of Ch. Bit 'O Luck Games By Parker and Ch. Bit 'O Luck Queen of Hearts a.k.a "Candy" (click More Bit 'O Luck to see "Parker", "Candy" and others). Another of our beautiful Bit 'O Luck Manchesters, Am./Can. Ch. Bit 'O Luck DemonMoons Encore CGC, also went to Canada and did extremely well in the Breed and Group rings - Devon has had many Canadian Group placements and numerous AKC Breed wins during his show career. After finishing his dual Championships, he came back "home" to permanently live with Kathy Bradley/WhirlWynd Standard Manchesters where he's loved and cherished and happily keeps everyone hopping. We're thrilled Devon has come back to the Midwest where he belongs and it's wonderful that we're able to see him so often. Please do not use any graphics from this site without permission.